SUPPORT OUR SITE: BECOME A CLUB MEMBER! 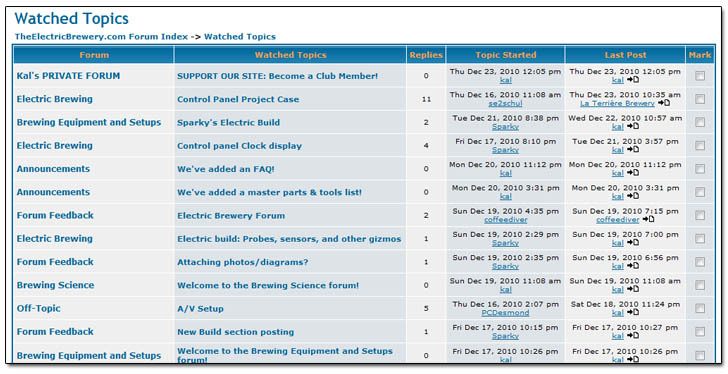 Link Posted: Thu Dec 23, 2010 4:05 pm Post subject: SUPPORT OUR SITE: BECOME A CLUB MEMBER! A "Club Membership" system is available for those that are interested in supporting our site. TheElectricBrewery.com is run by brewers like you. We pay for monthly bandwidth, server rental, and other various maintenance fees. Membership funds are used to help defray these costs. Your support is truly appreciated! Yearly or Lifetime memberships are available. No forum ads at all! Access to the Club Members Private Chat Room. Increased file attachment space for private messages (from 2mb to 200mb for yearly members, 2000mb for lifetime members). Increased file attachment space for forum posts (from 20mb to 200mb for yearly members, 2000mb for lifetime members). 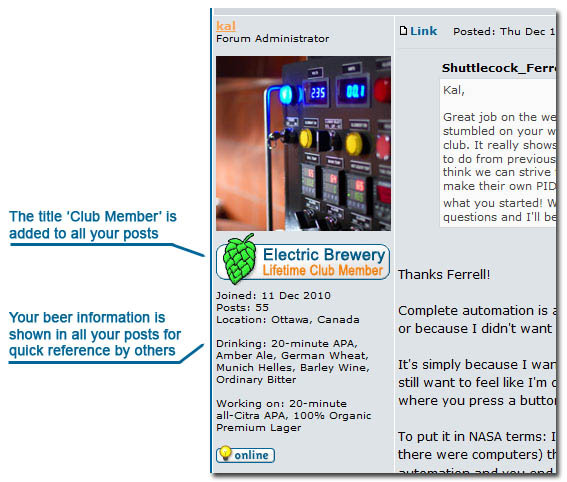 Ability to add a list of beers you've created and are still working on to your profile page for others to see. Both are also shown below your avatar in all your posts for quick reference. 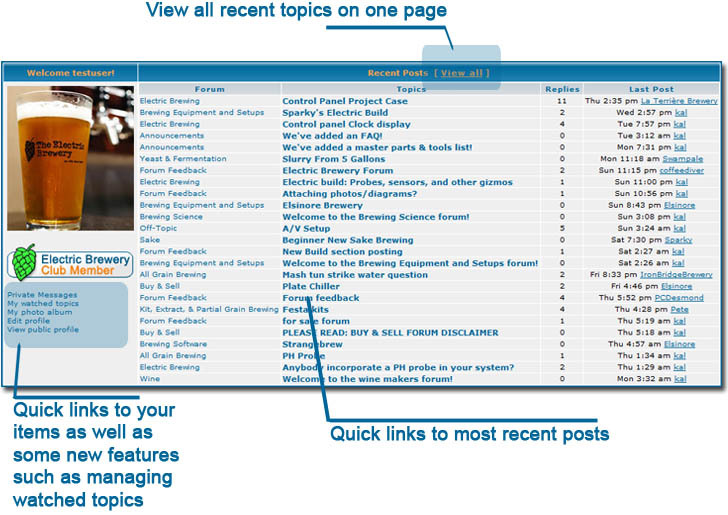 A 'Recent Posts' list on the main page for a quick view of new posts, including a 'View All Recent Topics' page making it easier to see what's new across the multiple forums. Your avatar displayed on the main page along with quick links to frequently used items. Ability to turn off the profanity censor so that you see all the naughty words that people are using. Access to a 'Watched Topics' page where you can manage your watched topics. Access to a 'Printer Friendly' tool for printing entire threads quickly and easily. 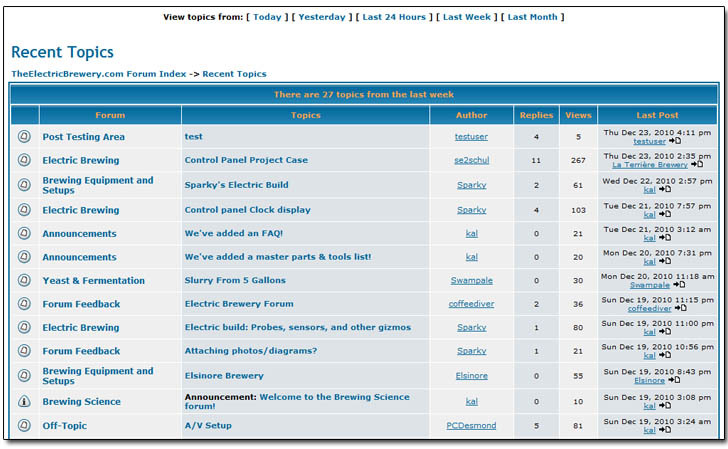 And last but not least: The warm and fuzzy feeling that you're helping support the site built by Brewers for Brewers! Cost: $20 USD per year or $100 USD for life. Payment methods: PayPal and all major credit cards. (A PayPal account is not needed to pay by credit card). Yearly subscriptions automatically expire after 1 year. They do not automatically renew. You may subscribe again at any time to extend your subscription by 1 extra year. Sign up as many times as you like. To verify your subscription status and expiry date, visit this page again after subscribing. Below are a few sample screenshots showing some of these features available to Club Members. Great deals!!! I just signed up for the life time membership. The recipes alone are worth much more then that. Did i mention this is a Great deal? No, thank you Castermmt! It's appreciated! I Joined Castermint in upgrading my subscription to Lifetime. I guess this is the good kind of lifer to be! Beer for life... guaranteed! Thanks for signing up! I mostly did it for the warm-fuzzy. As for features, what I'd most like is a capability to see threads with content I haven't read yet. Here I can see new posts since my last visit, but there is no memory of what I've read and not read. On another forum using a later version of phpBB I have this, and with the Tapatalk interface, when I go to a thread it drops me down to the first post I haven't read yet. Just upgraded to the Life Membership! Woohoo! Really, thanks Kal for what you've offered here to the homebrewing community. Cheers! Thanks for signing up huaco! It's really appreciated! Upgraded to lifetime. I think Kal is a great guy, very helpful and I have gotten so much information from this site. Besides...the recipes are great and the beer is even better. Keep up the good work Kal. Cheers from Guatemala! Just signed up for the Lifetime membership. I'm curious, are you saying I'm going to only live 20 more years.......just kidding.